Xbox has announced its Games with Gold promotion for February 2017 with 4 titles available throughout the month for players with an active Xbox Live Gold subscription! Starting us off with backwards compatibility, Monkey Island 2: SE will be available from February 1st-15th, then from the 16th-28th, Star Wars The Force Unleashed will be available for download. 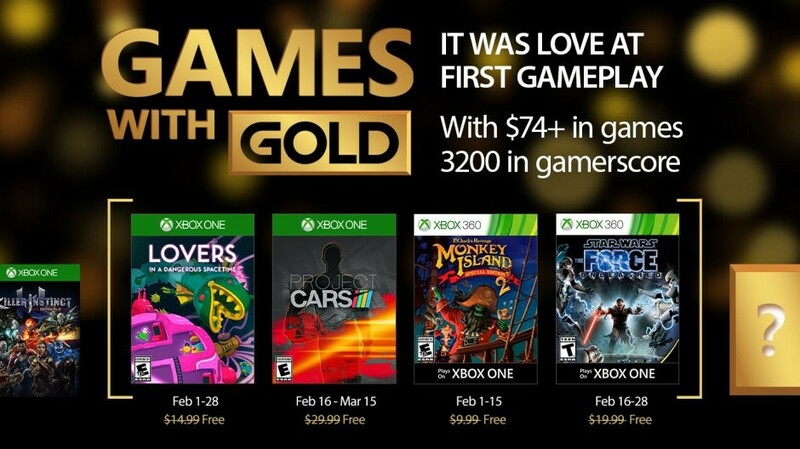 For original Xbox One games, starting February 1st and lasting all the way through the 28th will be Lovers in a Dangerous Space Time. Starting on February 16th and lasting until March 15th will be Project Cars. Xbox Live Gold members still have the option to download Killer Instinct Season 2 until February 15th. All of the February Games with Gold games will be automatically added to you library for download with an active gold subscription.